Domestic Apologist: Flying with babies and toddlers part II: five on-board favorites. Flying with babies and toddlers part II: five on-board favorites. Linking up today with lovely Hallie at Moxie Wife for her weekly five favorites. So we're past security (with or without a pat down is the question; I've had both, ugh) and survived terminal time. Now time for the actual flight! Take heart and perky up. Here are my five favorite strategies to create effective seat-bound baby/toddler distractions (most of which come from my beloved Dollar Tree) to occupy at least... well... a full 90 seconds of the flight. Sir Elmo and his button/zipper accoutrements is a toy unto himself. All airplane toys stay with the backpack, meaning that I'm never fishing through my already crowded purse looking for a new toy to whip out. 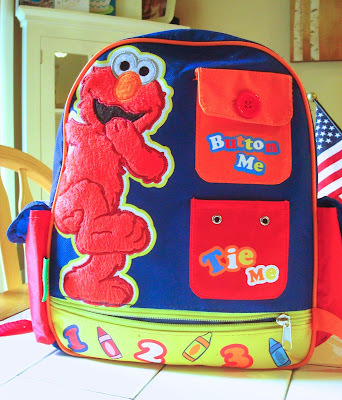 This backpack comes with a sippy cup pocket on either side, so it's a nice place to stash the boys cups or bottles too. Joe will be taking it to preschool soon and it's accompanied us on many a flight now, so I've more than gotten my money's worth out of it. And. I know some parents are all about wrapping up the toys to add another layer of distraction and surprise. I might do this one day, but toddlers + planes = stuff afoot EVERYWHERE to begin with. Not sure I'm game for adding an extra layer of debris to the carnage. 3. Back to the toys. Wind it up baby. Wind-up toys are FABULOUS airplane distractions. Quiet, fascinating, animated but requiring no batteries. Perfect for the tray table. Plays well with others. A mommy's dream. 4. Go for novelties and of-the-moment obsessions. Ice cream, ice cream trucks and ice cream cones were having a big moment at our house last summer. When I did my pre-flight dollar store run I found a 3-pack of these bubble bottles. Scooooore. (I emptied them of their soapy contents for the flight, of course.) Also, I hadn't introduced Joe to the wide world of Pez dispensers, so the foxy fellow below got thrown in my cart. Is this that wise guru guy from Kung Fu Panda? Does it even matter? Heck no! 4. Be like Noah. Bring 2. Notice a lot of toys in duplicate in this post? I learned the hard way when I bought only one wind-up shark that had a hinged body. Within seconds, Joseph had the head of it and Amby had the tail. And there was wailing and gnashing of teeth. My sister travels frequently with her kiddos too and brings two identical sets of snacks for each child. It's just never a bad idea to double up and avoid a meltdown sibling conflict if possible. 5. Flight all-star award goes to: Ball On String. Yes, they're sticky. Yes, they drop on the floor, yes I'm sure they're a choking hazard. But. Sucking on stuff prevents ears from hurting. And since we're still at a one-to-one parent/kid ratio, we're vigilant about watching them when they've got suckers in hand. Sometimes you just can't make the baby or a toddler drink any more gosh darn milk on the ascent or the geeeeeeze-this-is-taking-for-ev-er descent. I'm no fan of having my arms covered in sticky spots of creme soda or tutti fruity from Amby brandishing and wielding his Dum Dum like a conductor's baton between licks. But I'm even less a fan of holding a crying baby who's writhing in ear pain. Suckers win. Plus, you can get them at -- let's say it all together now -- THE DOLLAR STORE. Your turn. What flight favorites do you use? What have I been missing without even knowing it? And if you missed it... flying with babies and toddlers part I.
Ha! I chuckled at the, "Be like Noah." Great tips! Staying current with the trends can be easy if you don't mind doing a little bit of homework. Infancy is more complex than people think.